Does your teenager have a learning disability? If so, the whole college process might seem even more daunting. With these parents in mind, I recently talked with Joy App, a college consultant in Houston, who has worked with many teenagers with learning disabilities. I am passing along some of her advice for parents of learning disabled teenagers. To start, I’m sharing a book that App highly recommends for parents with students with a learning disability. She calls this book her bible: College Sourcebook for Students With Learning & Development Differences, which was written by Midge Lipkin. Sorry folks, but you can’t find this title on Amazon, but you can buy it directly from the publisher – Wintergreen Orchard. 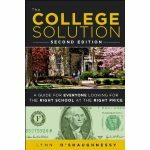 In App’s opinion, this book is superior to this popular title, K &W Guide to Colleges for Students With Learning Disabilities. App also shared with me schools that are considered strong for students with learning disabilities. She said in her experience private colleges and universities typically have better programs for these students than state institutions. I’m adding two more schools from the Midwest to this list – Westminster College (MO) and Augsburg College. If you want to recommend other schools, please share in the comment box below! Should You Disclose a Learning Disability? During the college admission process, many families struggle with the disclosure issue. “I’ve had people say to me that this will hurt their children’s chances,” App says. The Texas consultant, however, reassures parents that the admission and disability offices at any college are prohibited from talking to each other. Consequently, revealing a student’s issues with disability staffers will in no way jeopardize a student’s admission chances. Of course, this leads to the inevitable question of whether a student should reveal to an admission office that he or she is dyslexic, ADHD or possesses some other learning issues. I agree with App who says students should disclose this. It’s important to know if the institution is going to be friendly to LD students. “If a school is like Princeton,” App says, “and isn’t friendly to LD students, I want to know.” And, she added, if a school holds a disability against an applicant, that’s not the kind of school the student should attend. Colleges and universities are creating more structured learning support programs for their students with learning disabilities. There is a demand for these programs, but they can also be moneymakers for the institutions. Just because a teenager gets into a school doesn’t mean he or she will be accepted into the learning disability program. For instance, students who get accepted into the University of Arizona are not automatically accepted into SALT (Strategic Alternative Learning Techniques), which is highly regarded learning disability program. Students must submit a second application to get into SALT. In my next post I will share questions that App says that families need to ask a disability services office when visiting a college campus. We are moving to the Dallas area. Can anyone recommend small universities with good disability programs there? My son had LD/ADD college we have found are unaffordable and the other requires too much he has tested so many times over trying to achieved their standard requiremments.We have taken the SAT twice ,ACT,COMpass x 3 help! He really want to go to college to study Marine science. all these schools have shown that they will work with kids with LD but they are all pretty expensive (>$30k/yr). In addition, the schools have additional fees often ranging from $10-13k a year. Also the extent they work with students is quite broad. One school told my daughter if they think she needs a word bank or note card to get through a test they would give it to her but another with a very strong LD program said that wouldnt work. so the student really needs to be able to identify and communicate their needs to ensure the school is right for them. in the end it is up to the student to advocate for their needs and assist the school in finding a reasonable accommodation that the school and professor could accept. I greatly appreciate you adding to the list of colleges with solid learning disability programs, as well as your suggestions about evaluating programs! This is a very important topic! I have a son who struggles with organization, visual spatial deficits, and math ( due to a stroke in utero.) He has an Iep and receives extended time on tests, a bubbler, and separate location for tests. He is going to be a senior and am wondering how you felt High Point University was compared to Mcdaniel in regards to their services. We have visited both schools and I know Mcdaniel has a specialized program. I have a sone who is a junior in high school with learning disabilities to be exact is Mix Receptive Language disorder. Im looking for colleges for him, He is a slow learner,repetitive learner and so on. Also wondering if there are scholarships for students with learning disability. Ok so I have been told that I possibly have Dyscalculia Math learning disability but I am in college and no insurance I just wondered how does someone get help! I spoke to a dr and he said $1,000.00 for a diagnosis so that will never happen! I just do not now know where to turn I can’t help in college unless I can get a diagnosis! I am 3 classes away from my bachelors degree and I might have to drop out because I can’t do he Math! With a diagnosis I can take equivalency classes to satisfy my math requirements! I just don’t know where to go or who to go to! I am in Port Saint Lucie Florida, east coast! Anyone know where I go??? Sorry about your problem. Have you maxed out your federal student loans for your senior year? I would borrow $1,000 through the federal direct subsidized/unsubsidized loan and use money to get your diagnosis. You can borrow up to $7,500 as a senior. I’d shop around for a better price for the diagnosis. Ask the learning disability office at your college for suggestions. You might also seek a suggestion on a diagnosis from your old high school counselor. Loras College in Dubuque IA has offered an Enhanced Program for students with LD/ADD for over 25 years! Please visit our website to learn more. Search for “Vocational Rehabilitation Florida” VR will help you get tested for a reduced price and sometimes free to prove to your college you have a disability. There should be a local office near you. Good luck. You should add Westfield State University in Massachusetts. They have excellent LD services. As a special educator and mother of two sons with LDs I was impressed with the level of support they provide. Thanks Viviana. I will do so. I would like to add a little gem I found in Leesburg, FL. The name of this school is Beacon College. It is specifically designed for student with Learning Disabilities, ADD/ADHD, etc. The only way to gain admissions is to have a documented disability. I would have loved for my son, William, to attend the school, unfortunately, I could not afford the cost of attendance. For those of you who can afford it, look into it. I doubt if you will be disappointed. As one of the previous comments stated: many colleges say they are committed to LD kids, but their actual accommodations do not measure up. This school certainly does measure up. (except for the cost). Now I’m looking for a cheaper college that can come remotely close to the accommodations Beacon provides. Wish me Luck. My husband is dyslexic and he has always spoken openly about it in interviews and applications. He attended Haverford College and the Tuck School of Business at Dartmouth College for his MBA. Both were wonderful and extremely helpful with accommodations. Dyslexia is an integral part of who he is and how he sees the world. As a speech therapist and admissions editor, I would be really honored to help any applicants with disabilities write and revise their admissions essays. If you are simply too anxious to sit down and write the application essay, record yourself as you talk to a trusted friend or mentor about your hopes and dreams. Often, the ideas are all there but the format of the application essay is just too intimidating. Remember, you only need to answer the essay question, not write great literature! Visit http://www.thehonesteditor.com for more advice and help. Thanks Lynn for sharing this important information. As a parent of some very bright students with learning differences, and being married to a reading therapist who works with many students with learning differences, I am acutely aware of the need for reliable information that families want and are seeking. Thank you for sharing. I would add Augsburg College and Westminster in Missouri too. The Groves School College Fair in Minneapolis is the largest college fair west of the Mississippi that serves students and families with learning differences. The only other comment I would make is that a lot of institutions claim to be committed to serving students with learning differences, but they don’t walk the talk. It is important to confirm the reliability of promises made. The University of Wisconsin Whitewater enrolls numerous students with various learning, physical and mental disabilities each year. We even host a visit day just for student’s with disabilities each spring. Check out this link to find our featured students in the news! Thanks Sarah for the heads up and link!